Efforts to restore an "almost" extinct species of Northwest salmon -- one that showed no reproductive capability in the early 1990s -- are reaching a turning point that is expected to leave extinction fears in the past. Work on the construction of a new Snake River sockeye salmon hatchery in southeastern Idaho is expected to be completed in December. Eggs from the latest return of sockeye salmon will soon be delivered to the hatchery so that they can be cultivated to produce a next generation. Annually, IDFG and NMFS broodstock hatcheries will provide fertilized eggs to Springfield Hatchery and smolts reared there will be transferred to central Idaho's Sawtooth Valley each spring and released to the outlet of Redfish Lake. The new hatchery is expected to produce up to 1 million smolts, young fish just over a year old that are physiologically ready to head for the Pacific Ocean to grow and mature to adulthood. It is estimated that a respectable share of those young fish will reach maturity and return from the ocean to spawn and produce a next generation. The Snake River sockeye, which pretty much "winked out" in the early 1990s, are on the rise. 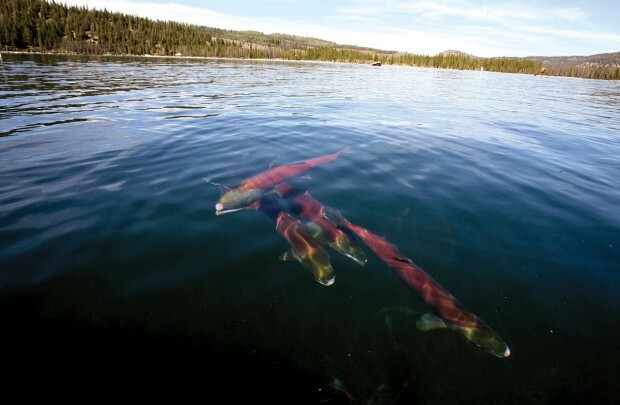 Only 16 sockeye are believed to have returned to central Idaho's Stanley basin from 1991-1998. The plummeting population trend resulted in the species being listed in November 1991 as endangered, which prompts the most extreme protections called for under the federal Endangered Species Act. A hatchery captive broodstock program was implemented earlier in 1991 in an attempt to preserve what little Snake River sockeye genetic material that remained. The program headed by the Idaho Department of Fish and Game, in cooperation with the Bonneville Power Administration, the Shoshone-Bannock tribes, the Northwest Power and Conservation Council, the state of Oregon and Washington and others has slowly lifted the Snake River sockeye population toward viability. Dam counts at Lower Granite Dam on the lower Snake have risen from 79 for the 1991-1998 period to 7,678 from 1999 through 2013. Passage at Lower Granite leaves the fish still about 400 river miles short of their goal of reaching central Idaho spawning grounds in Redfish Lake. The captive broodstock program has been an experiment, attempting to see whether the outplanting of fertilized eggs, so-called "pre-smolts" or ocean-ready smolts (fish aged over 1 year old), produced the best in terms of adult spawner returns. The smolts have proven to be the ticket. "That's pretty easy to understand," Paul Kline, the IDFG's assistant chief of fisheries told the Northwest Power and Conservation Council Wednesday. Thus far in the Snake River sockeye program smolts have produced the highest returns of adult spawners, so they will now be the focus of the hatchery program. Outplanting of eggs and of pre-smolts will cease. And fish that do survive the round trip from central Idaho to the ocean and back again and allowed to spawn naturally have been shown to provide more than double the percentage of next generation spawners as compared to fish reared to adulthood in hatcheries and then released into the wild. As a result, the captive broodstock program has shifted from a conservation to a restoration phase. The program has been carried with "borrowed" hatchery space that has allowed the production of up to 200,000 smolts. The new facility will allow production of up to 1 million smolts, with the expectation that more adults will return, which will produce more resilient "naturally produced" stock. Ultimately, the program expects to produce enough naturally spawning fish that the hatchery program can be phased out. Since the species was listed as endangered in 1991, the IDFG, NOAA Fisheries, and the Shoshone Bannock Tribe have operated a captive brookstock program using a hatchery in Eagle, Idaho, primarily, to rescue genetic material from the few remaining fish and begin rebuilding the run by releasing hatchery-bred eggs, presmolts, and smolts into natal waters to encourage natural production. The near-term goal is to avoid extinction and maintain genetic diversity. The long-term goal is to rebuild naturally spawning populations to levels that could support tribal and sport harvest. The new, $13.5 million hatchery near Pocatello is an important step toward the long-term goal. Eggs produced at other hatcheries operated by IDFG and NOAA will go through final incubation and rearing to the smolt stage at the Springfield facility and then be released each spring at the outlet of Redfish Lake, a primary sockeye spawning area. Other Idaho high country lakes that have previously been hosts to sockeye spawners are Alturus and Pettitt. The Snake River sockeye swim the farthest upriver of any in the world (900 river miles) and climb the highest (6,000 feet elevation). The Snake River stock also has the southernmost origin of any sockeye. Redfish Lake is the initial focus of the increased smolt releases. Of the three Salmon River headwaters lakes, Redfish is the one with the greatest sockeye-production potential. As the returns improve, additional hatchery actions will be taken to restore natural production in the other two lakes, Pettit and Alturas. -- Dec. 2, 2013: Estimated ship date of the first sockeye eggs to Springfield Hatchery. -- July, 2017: Estimated return date of the first cohort of "Springfield adults" to Redfish Lake as 4-yearr olds. Much of the Snake River sockeye restoration work is funded by the Bonneville Power Administration through the NPCC's Columbia River Fish and Wildlife Program. BPA, which markets power generated in the Columbia/Snake river power system, provides ratepayer funding as mitigation for hydrosystem impacts on fish and wildlife.